Jon Lester held the Tigers to just one run over seven innings, and the Red Sox managed to wrangle two runs of Detroit ace Max Scherzer as Boston rebounded from Monday's Labor Day loss with a 2-1 win at Fenway Park. 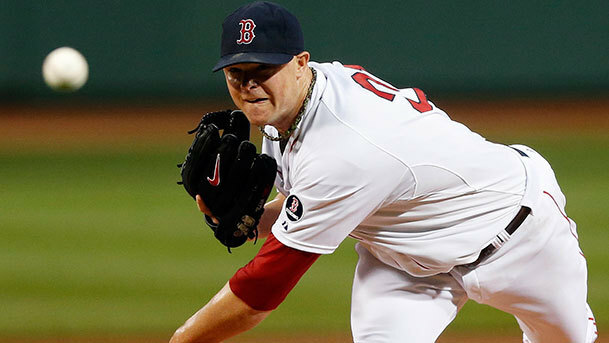 Lester (pictured) struck out a season-high nine while scattering eight hits and not allowing a walk in getting his thirteenth win of the year. It was only Scherzer's second loss. The Tigers scored first on an RBI double by Jose Iglesias (remember him?) in the top of the second inning. Boston answered back in the bottom of the fifth inning. Jonny Gomes singled and moved over to third on a ground rule double by Stephen Drew. One batter later, Will Middlebrooks drove both in with a single into center field. Koji Uehara pitched a 1-2-3 ninth inning for his seventeenth save of the season. The Red Sox managed only five hits off Scherzer, two of them by Gomes. Boston was without Jacoby Ellsbury (bone bruise, left hand) and Jarrod Saltalamacchia (sore lower back).